Added by Sheryl Hamlin on February 7, 2019. Measure T was approved by the voters in November 2016 adding 1% to the sales tax. As a General Tax, all revenues go to the General Fund with no specific use; however, there was language in the ballot suggesting priorities for the monies to be public safety, streets and youth services. An Advisory Commission was established to recommend the allocations of the funds. The City established Fund 104 to be able to segregate the Measure T monies for accounting and allocation. Subsequent to the passage of Measure T, the city was annexed into the Ventura County Fire district, which changed the allocations considerably with each remaining priority receiving more than anticipated. In the first year, only 30% of the Measure T monies were allocated for the FY 17/18 budget with $1.5 million to be carried over to FY 18/19. See that budget here. The FY 18/19 budget allocations are shown here. 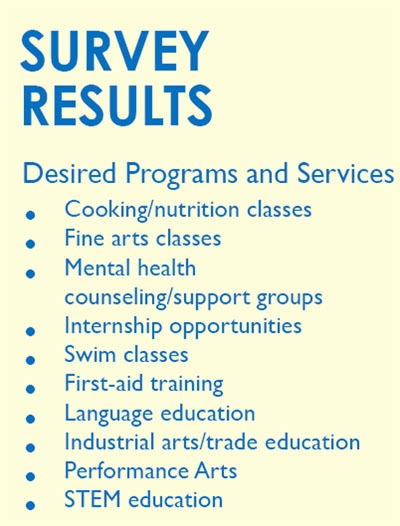 Note the large amount for Youth Services, part of which was a Youth Needs Assessment Survey. Additionally the Community Services (now ‘Park and REC Department) hosted successful summer programs in 2018 subsidized by Measure T monies. This Survey was finally presented to council, but not without issues over payment which were negotiated at a previous council meeting where the consultant wanted additional funds to present the report to different groups. The consultant from RRM Design indicated the high level of survey participation. 902 Youth Surveys and 349 Parent/Adult surveys were received in both English and Spanish. This large number, according to the consultant, gave the results more statistical validity. The modal category (largest percentage) from the participation survey received from the youth was the 30% who participated in NO Youth Programs. Of the remaining 70%, the highest participation rates were from Sports, School Clubs, Boys & Girls Club and Church groups. The adult responses mirrored the youth responses with 25% not participating in programs and the other 75% with similar preferences as the youth respondents. Of the Not Participating responses, the reasons for non-participation were: 1) not interested, 2) cost and 3) lack of transportation. The consultant concluded that the City should provide the facilities for the programs and/or partner with the school district or the county. It would appear that the cooking/nutrition and industrial arts/trade education could be resolved by reviving the Home Economics and Shop classes that have been dropped over the years. Fine Arts gave way to digital classes, but it appears that this decision should be revisited. The school has a pool, so why are there not more swimming classes? The school has a stage and a band and SPUSD produces plays, so the item “Performance Arts” could be referring to performance as a career. STEM is the focus of the new building at SPUSD. It is notable that in a recent Yahoo! News article, the highest job growth occurred in the field of Solar Panel Installation, which is a hands-on job requiring mechanical dexterity and an understanding of electricity. The Mental Health aspect could be fulfilled in many ways from professional intervention or simply by finding a fulfilling activity for the youth. The list of needs above appears to be what public schools used to provide. However, it has not gone unnoticed that trade schools and trade education fill an important role for both the abilities of the student and the needs of the economy. This Forbes article explains how the shop group was considered “inferior” to the brain surgeon class, so the schools decided to herd students into the college path regardless of aptitude or interest. SPUSD should take a deep look at its curriculum. With the students requesting topics/activities that the district could/should provide, might the addition of these be a way to bring back students who have left the district? The district’s enrollment has been steadily declining. It was noted that the school district was given a copy of the presentation. To watch the meeting click here. The City of Santa Paula celebrated the inauguration of its Teen Center in Las Piedras Park where hundreds of teens attended. Additionally , the Ignite Teen Program for “at risk teens” presented its programs to the city council. Ignite is operating in Santa Paula out of the Catalyst Church on Tuesdays and Thursdays after school. Click here for details.